Ergonomic design and embedded software make this high accuracy on-site multifunction calibrator an easy to use high performance tool. "Buy it: you'll like it, Guaranteed"! The new Wahl C150 Calibrator is a high accuracy instrument which integrates all the necessary functions for calibration and maintenance of processes, making it the ideal instrument for maintenance, quality control, and calibration. A Bluetooth® interface and quick access to functions makes this a high performance instrument perfect for on site use. IP 54 rated, and fully protected by an anti-shock boot, with integrated quick connect terminals and a high-contrast backlit display, it is comfortable to use in all conditions. 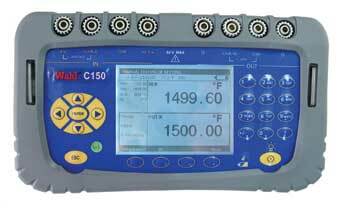 C150 Calibrator is supplied with 6 testing leads with crocodile clips, quick battery charging system, neck strap, and stand for desktop use, User Manual on CD Rom, attache style professional carrying case.